Ensure all evidence, no matter how large, is documented with maximum accuracy using the Extra-Large Folding Scale from Lightning Powder. Designed for forensic application, the enlarged scale is ideal for when investigators need to reference the size of large items such as walls, tables or cars. 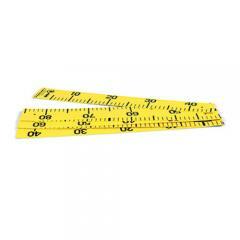 The scale is colored bright yellow for easy identification and features both metric and imperial measurements. The device measures almost 2.5 meters, or eight feet, in length. Its folding design bends at every 50 centimeters or almost 20 inches, for easy and convenient storage. The scale can be cleaned with simple soap water or sterilized in a basic 10% bleach solution.